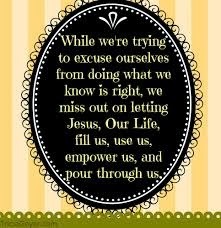 MORNING MANNA : Oct 15 - NO EXCUSE GOOD ENOUGH ! Oct 15 - NO EXCUSE GOOD ENOUGH ! “The man said, The woman whom Thou gavest to be with me, she gave me of the tree, and I did eat” (Gen 3:12). Sin makes a person blame others for one’s own mistakes. Adam here blames the woman for his sin. Every soul is responsible for his own sin. Adam might have eaten of the tree from the hands of the woman, in order to please her and show her his love for her. But now, instead of showing love, he shows only hatred by blaming her for his sin. And when God gives the woman a chance to repent, she blames the serpent (Gen 3:13). True, the serpent did deceive her, but why did she give the fruit to her husband? The serpent didn’t tell her to give it to him, did it?